As the days of our lives continue to turn, more lawyers are awakening to the benefits of selling their law practice/business, and reaping the financial rewards of their legacy. 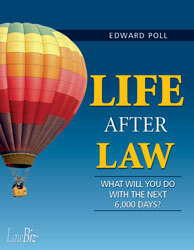 The issue becomes ... "how..."
First, read Life After Law: What Will You Do With the Next 6,000 Days? Go to www.lawbiz.com/store and place your order. Then, test the water for six months on www.lawbizregistry.com. Call me if I can help further. (800) 837-5880. Cheap underwear caused a "brief" moment of discomfort—and hilarity—during a House of Commons sessions when a Canadian legislator left in a hurry during a vote because, he said, his newly purchased underthings—bought at a bargain price—were too small and constricting. The legislator did manage to return to cast his vote, according to a Yahoo! odd news article. However, this story drives home the point that is you plan to "jockey" for a position of success in your life, you should be aware that you get what you pay for. Thus, as a law practitioner, you should be cautious about purchasing items and services for your business. Technology that seems too good to be true might just be too good to be true—you might not, for example, be able to use it for the kinds of tasks that you do on a daily basis. Office space that seems like a good deal might end up being not such a great deal if you discover that heating costs for that space are outrageously expensive or that parking for clients is an issue. In addition, as a law practitioner, you should not be afraid to have the philosophy that your clients get what they pay for. Don't sell yourself too cheap. Obviously, clients want to pay as little as possible and might complain about your fees, so your job is to educate your clients about the value of your services. Make sure that starting from the initial meeting, you explain to your clients what they can expect from you. When you bill clients, make sure that your bills show in detail the services that you have provided so that clients feel like you deserve the money that you are asking for. And, finally, make sure that you treat your clients as you would want to be treated—clients who feel that they are special are clients who feel that they are getting what they pay for.